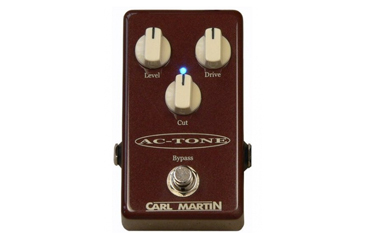 The new `single channel` AC-Tone, is a smaller pedal-board friendly, single channel version of the original Pro-Series AC-Tone. It features 3 knobs and 1 switch and has a slightly beefed up Gain section, but shares the very same tone as its big sister! The single AC-Tone also incorporates our new DC-DC converter circuitry, so the pedal can be powered by a regulated 9V Power Supply but will still operate on the same +-12V level as the original AC powered AC-Tone. This allows us to use the same high quality components which provide the same tone and headroom that make the CM Pro-Series pedals stand out from the rest!